Yala National Park (also known as Ruhunu National Park) is the most visited and second largest national park in Sri Lanka. Actually it consists of five blocks, two of which are now open to the public; and also adjoining parks. It is situated in the southeast region of the country, and lies in Southern Province and Uva Province. The park covers 979 square kilometres (378 sq mi) and is located about 300 kilometres (190 mi) from Colombo. Yala was designated as a wildlife sanctuary in 1900, and, along with Wilpattu it was one of the first two national parks in Sri Lanka, having been designated in 1938. The park is best known for its variety of wild animals. It is important for the conservation of Sri Lankan Elephants and aquatic birds. The western part of Yala (block one) is named as the area with the highest leopard concentration in the world. Do realize that with only 35 leopards in the entire park the chances of actually seeing a single leopard are still relatively slim. Yala is situated in the lowest peneplain of Sri Lanka, which extends from Trincomalee to Hambantota. Topographically the area is a flat and mildly undulating plain that runs to the coast with elevation is 30 metres (98 ft) close to the coast while rising in the interior to 100–125 metres (330–410 ft). The national park is situated in the dry semi-arid climatic region and rain is received mainly during the northeast monsoon. The mean annual rainfall ranges between 500–775 millimetres (20–30.5 in) while the mean temperature ranges between 26.4°C (79.5°F) in January to 30 °C (86 °F) in April. It is windier in Yala, during the southwest monsoon compared to the wind during the northeast monsoon with wind speeds from 23 kilometres per hour (14 mph) to 15 kilometres per hour (9.3 mph). Yala National Park has a variety of ecosystems including moist monsoon forests, dry monsoon forests, semi deciduous forests, thorn forests, grasslands, fresh water and marine wetlands, and sandy beaches. The area under forest cover mainly consists of Block I and rangelands of open parkland (Pelessa grasslands) including some extensive grasslands. The forest area is restricted to around the Menik River while rangelands are found towards the sea side. Other habitat types of the Block I are tanks and water holes, lagoons and mangroves and chena lands. The mangrove vegetation in the Buthuwa lagoon is largely Rhizophora mucronata while Avicennia spp. and Aegiceras spp. are less abundant. The vegetation of Block II is similar to those of Block I, and Yalawela, once a fertile paddy field, represents Pitiya grasslands. The mangroves of Block II occur around the estuary of Menik River, which extent to 100 hectares (0.39 sq mi). The common mangrove plants are Rhizophora mucronata, Sonneratia caseolaris, Avicennia spp., and Aegiceras corniculatum. The lagoons of Pilinnawa, Mahapothana, and Pahalapothana are also located in this block. The other common mangrove species are Sonneratia caseolaris, Acanthus ilicifolius, Excoecaria agallocha, and Lumnitzera racemosa. In the bare sand Crinum zeylanicum is found. Of 215 bird species of the park, six are endemic to Sri Lanka. They are Sri Lanka Grey Hornbill, Sri Lanka Junglefowl, Sri Lanka Wood-pigeon, Crimson-fronted Barbet, Black-capped Bulbul, and Brown-capped Babbler. The number of waterbirds inhabiting wetlands of Yala is 90 and half of them are migrants. Waterfowls (Lesser Whistling Duck, Garganey), Cormorants (Little Cormorant, Indian Cormorant), large waterbirds (Grey Heron, Black-headed Ibis, Eurasian Spoonbill, Asian Openbill, Painted Stork), medium-sized waders Tringa spp., and small waders Charadrius spp. are among the common waterbirds. Black-necked Stork and Lesser Adjutant are the rare birds that can be seen in the park. The migrant Great White Pelican and resident Spot-billed Pelican are also have been recorded. Other waterbirds attracted to the Yala lagoons include Lesser Flamingo, and Pelicans, and rare species such as Purple Heron, Night herons, Egrets, Purple Swamphen, and Oriental Darter. Thousands of waterfowls migrate to the lagoons of Yala during the northeast monsoon. They are Northern Pintail, White-winged Tern, Eurasian Curlew, Whimbrel, Godwits, and Ruddy Turnstone. The visiting species mingled with residing Lesser Whistling Duck, Yellow-wattled Lapwing, Red-wattled Lapwing, and Great Stone-curlew. Rock Pigeon, Barred Buttonquail, Indian Peafowl, Black Stork, Black-winged Stilt, and Greater Flamingo are among the other bird species. Crested Serpent-eagle and White-bellied Sea Eagle are the raptors of the park. The forest birds are Orange-breasted Green Pigeon, Hornbills, Old World flycatchers, Asian Paradise-flycatcher, Asian barbets, and Orioles. 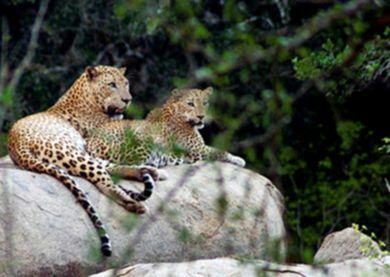 44 species of mammals are resident in Yala National Park, and it has one of the highest leopard densities in the world. The elephant herd of Yala contains 300–350 individuals. Sri Lankan Sloth Bear, Sri Lankan Leopard, Sri Lankan Elephant, Wild water buffalo are threatened species. Toque Macaque, Golden Palm Civet, Red Slender Loris, and Fishing Cat are among the other mammals that can be seen in Yala. The reptile fauna recorded from the park is 46 and five of them are endemic: Sri Lankan Krait, Boulenger's Keelback, Sri Lankan Flying Snake, Painted-lip Lizard and Wiegmann's Agama. 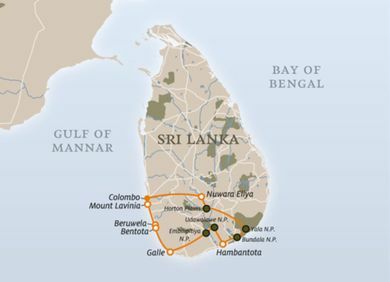 The coastal line of the park is visited by the all five globally endangered sea turtles (Leatherback turtle, Olive Ridley, Loggerhead Sea Turtle, Hawksbill turtle, and Green turtle) that visit Sri Lanka. The two breeding crocodile species of Sri Lanka, Mugger crocodile and Saltwater Crocodile inhabit the park. The Indian Cobra and Russell's viper are among the other reptiles. There are 18 amphibians species that have been recorded from Yala while Bufo atukoralei and Adenomus kelaartii are endemic to Sri Lanka. In the water courses of Yala, 21 fresh water fishes are found. The fish population in the perennial reservoirs contain mostly exotic food fish Mozambique tilapia. The Stone sucker and Esomus thermoicos are endemic among other species. The Blackspot barb, Olive Barb, Orange chromide and Common Spiny Loach are the common fish species. Crabs and prawns include the fauna in the lagoons of the park. A variety of butterfly species is found here. The Common bluebottle, Common Lime Butterfly, Crimson Rose, Common Jezebel, and Common Mormon are the common species. It is most easy to take a tour from the nearby town of Tissa (Tissamaharama). If you come from north then take a direct bus to Tangalle, Matara, Galle, etc, and hop off at a Tissa-Punnegamuwa-Junction Stop. Then you have to take a tuk tuk (150-300LKR) for ca. 4km to Tissa. From Tissa leaves many buses to Matara - I assume from the south you can drive to Tissa directly. To get to the National Park you can take a tour from any number of guest house/hotels in the city. Most leave at 4:30/5:00 or 14:30, but it depends on if you are going for half/full day or overnight. The entrance to the park is about 3,700 rupees, but it changes often. The tours should cost about 4,000 to 6,000 on top of the admission ticket. It is usually split between the people in the truck, but you should negotiate this. It can be expensive to do alone, so it is best to try and partner with others to increase bargaining power. The tour guides often will use you as bait for people coming off buses. It makes both your lives easier to meet the people off the buses right away, as it gets competitive and most drivers will call their friends to tell them you are coming. They all know what travelers are coming here for. It is also possible to stay at a bungalow more near the park, but it may cost more and is a little more difficult to reach alone. You can visit the park (Katagamuwa entrance - distance 8KM)from Kataragama. Half day trip would cost you from LKR 4500 to 5000. Currently 3,700 rupees for a day pass. About 3,700 for a day pass. And about 6,000 for a half day tour and about 10,000 for a full day tour. If you add more people everyone needs a day pass, but the tour part stays more or less the same (maybe add about 500 per person). Prices will start at a ridiculously high number, but bargain hard and don't be afraid to walk away and try another hotel. Tipping: According to Tripadvisor: Driver/guide: LKR 300-500/day. Tips are always down to discretion. Yala National Park is one of the best places for sightings of wild Elephants. The park is home to many animals including Buffaloes, Leopards, Monkeys, Circles, Crocodiles, Wild boars and Bears. The cats chuff can be heard from a distance and is so soporific. They love to bask in the sun at the top of 30ft rocks and it’s breathtaking, so take a zoom/telephoto lens. Feb-Jun/Jul is the optimum time to visit when water tables are low. Leopard, elephant and many smaller animals are competing for the same drinking supply. You are likely also to see sloth bears, deer, wild boar, buffaloes, crocodiles and monkeys. Birds are in profusion – up to 130 species. The park also contains a monastic settlement, Situlpahuwa and other important centres of pilgrimage. Be aware Yala is usually closed in September. Yala: Wild boar - Looking for something!! There is a small and spartan store at the entrance. It sells crisps and soft drinks mainly. It is best to bring your own snacks for the duration of your trip. It is advisable for you to take bottled water before entering to the park. Guidebooks warn you about getting off the bus early (coming from south? )- at the clock tower (Debarawena) - most of the cheaper accommodation are there (2km from Tissa Town), but the touts there ARE strong. Beware that if you choose a cheap guesthouse (price-range like everywhere in Sri Lanka). then they might be really aggressive about selling safari tour. Enjoy the comforts of a luxury hotel or resort while being surrounded by thick jungles and wild animals. Glamping is where luxury meets nature and it's a new way to camp without compromising your comfort! Wild Coast Tented Lodge, Palatupana, (neighbouring to Yala National Park), Yala 82600. ☎ + 94 117 745 730. Check-in: 2pm, Check-out: 12pm. With the Indian Ocean on one side and the rugged jungle on the other, Wild Coast Tented Lodge provides a great glamping experience. The main resort building and villas, known as 'Cocoons' and 'Urchins' are designed to resemble rocks and boulders that are scattered in the area, while the entire property outlines a leopard's paw print. Guests are given an exclusive experience of a wildlife safari with the resort's expert naturalist. Rates from the official website start at USD 700. Just stay in the vehicle. These are wild animals. There are crocodiles hidden everywhere, dangerous lizards, and heaps of other troublesome critters. Also hold on; the ride gets very bumpy and it's easy to bang your head or get tossed around. This page was last edited on 19 April 2019, at 06:03.